With Rename Expert, file names can be shortened to any length. Files with a path length of more than 260 characters can be no longer edited using Windows Explorer. For example, they can no longer be opened or renamed. Through the support of paths with up to 30,000 characters, Rename Expert can read and rename these files easily. The length of the file names may optionally be displayed in a column of the preview list and used as a sorting criterion. Furthermore, you can find long file names by applying the filter to the length of the path and name. Rename Expert provides several options to shorten file names. 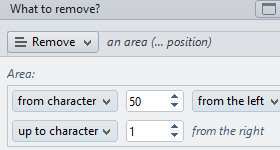 For instance you can delimit the number of words or characters contained in the name.